There are many different reasons why a couple can be having difficulty when trying to conceive. One prominent condition which could be relating to a female or male having reproductive issues is because of high estrogen levels infertility. The condition can also be referred to as estrogen dominance, which can happen in either partner and may stop them from becoming pregnant. High estrogen levels not only hinder pregnancy, but can also be responsible for other conditions and illnesses. However, the condition can be treated using natural methods and can improve the odds of a couple being able to become pregnant. 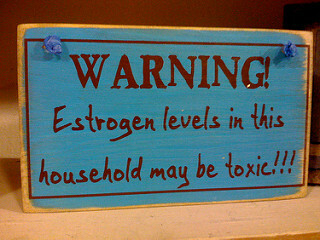 Estrogen dominance causes massive amounts of the hormone to be release when compared to levels of progesterone, which makes the person experience an imbalance. Progesterone and estrogen are the two main forms of female hormones and during the menstrual cycle, they play an important role in the maturation and release of an egg. Another role of the hormones is to prepare the female body for pregnancy. Without sufficient levels of each hormone a woman will not ovulate and the uterus will not be prepared for a fertilized egg, and without these conditions a woman can experience recurrent miscarriages or may not be able to become pregnant at all. There are many reasons why a person could have high estrogen levels infertility related problems. Some of the main reasons are stress, inadequate diet, hormone replacement therapy and repeated exposure to environmental estrogen's. When trying to conceive a baby, it is important for both the man and the woman be tested, when estrogen dominance is suspected to be the culprit behind infertility. It is recommended for a couple that is experiencing estrogen dominance to eat a healthy diet, incorporate regular exercise, lose weight if necessary and always follow the advice of a fertility specialist. When a couple is experiencing fertility impairment, it is important to know when to consult with a specialist. Some conditions like estrogen dominance can be successfully treated and managed by incorporating some simple lifestyle and dietary changes; some will require medication to alleviate the condition. The most important thing a couple should do when trying to have a baby is to always adhere to the advice and recommendations of a medical professional and make healthy personal choices which will increase the odds of conception as well.